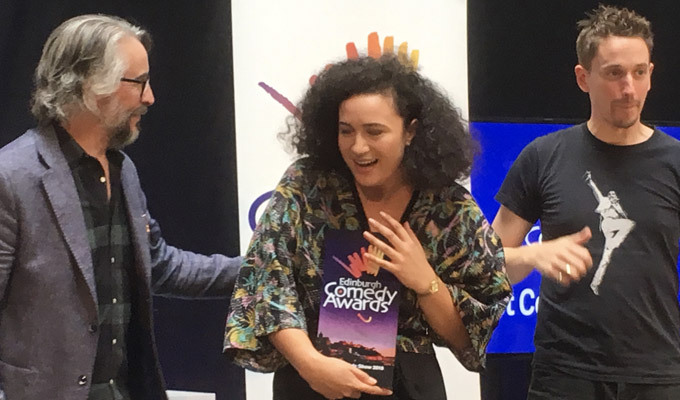 Rose Matafeo has become the first solo non-white winner of the Edinburgh Comedy award. The New Zealander, whose father is Samoan and her mother is Scottish-Croatian, won for her show Horndog. Choking back the tears of joy, she also praised Josie Long and David O’Doherty who inspired here as a teenager, as well as her agent and comedy pals in Edinburgh. Also nominated this year were Ahir Shah, Alex Edelman, Felicity Ward, Glenn Moore, Kieran Hodgson and Larry Dean. Best newcomer went to Ciaran Dowd for his ’really stupid show’ Don Rodolfo, about a Zorro-syle swordsman. He thanked his director Tom Parry and his agent, but admitted he ‘fluffed’ an acceptance speech that seemed to catch him by surprise. Both the award-winning shows were performed at the Pleasance. The panel prize was won by Home Safe Collective, which crowdfunded a taxi account to provide lifts to comedians late at night. Angela Barnes, one of the driving forces behind the initiative, said the £5,000 prize would go towards running the scheme again in 2019: ‘We will be doing it next year, bigger and better,’ she said. The main award was given in honour of the late Sean Hughes, who pioneered the storytelling style of stand-up now so prevalent on the Fringe. The only other person of colour to be recognised with the main award was Richard Ayoade, part of the team behind 2001 Perrier-winner Garth Marenghi's Netherhead.